A protest against SOPA and the PROTECT IP Act. 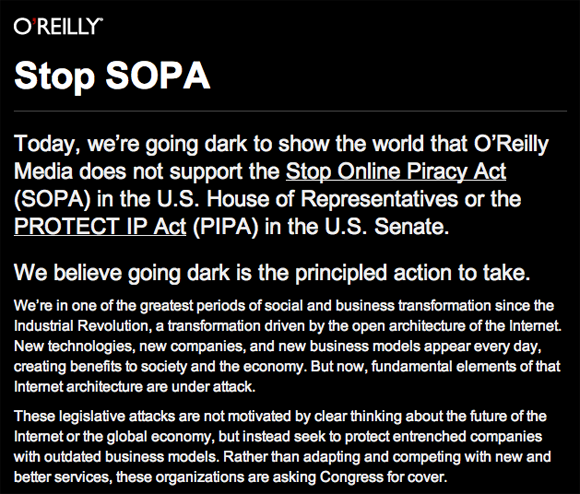 On January 18, 2012, O’Reilly went dark to protest the Stop Online Piracy Act and PROTECT IP Act. The following notice was posted across oreilly.com. Today, we’re going dark to show the world that O’Reilly Media does not support the Stop Online Piracy Act (SOPA) in the U.S. House of Representatives or the PROTECT IP Act (PIPA) in the U.S. Senate. We’re in one of the greatest periods of social and business transformation since the Industrial Revolution, a transformation driven by the open architecture of the Internet. New technologies, new companies, and new business models appear every day, creating benefits to society and the economy. But now, fundamental elements of that Internet architecture are under attack. Over the weekend, President Obama’s technology officials told the American people that they do not support SOPA or PROTECT IP as drafted. The White House’s response to a "We The People" e-petition included a strong rebuttal against the DNS provisions in the bills. While it is heartening to hear from the White House that it "will not support legislation that reduces freedom of expression, increases cybersecurity risk, or undermines the dynamic, innovative global Internet," we believe these bills must be abandoned, not amended.